Cuisine-ly speaking, you can travel around the globe in less than one mile along Sprague. At the eastern end of this short trip is O’Dohtery’s where a clock on the wall counts down the seconds to the next St. Patty’s Day and on the far end of this worldly mile heading into the sunset is The Three Sisters Vietnamese and Chinese Cuisine that gets the very high Urbanspoon rating of 90 percent ladling out a Pho they say is unfogetable. In between Ireland and Vietnam lie a handful of eateries representing countries near and far. The majority of the owners were born in these foreign lands far beyond the Spokane Valley city limits. I am not sure what it means but I think it might say that people, including restaurateurs find our little neck of the planet to be a nice place to set up camp. Though it seems unlikely, maybe it just means that these folks think we have a wide range of taste here. At any rate we certainly have a wide range of selection in that short but global mile. You can dine in the Orient at the HuHut Mongolian Grill or at the Sushi Saki just across the street. Abelardo’s next door puts you back in our hemisphere south of the border. The cooks may not know English real well but they know how to serve fluent Mexican. Trust this gringo when I tell you that the American dollar goes a long way at this place. If you have a belly that can bury one of their burritos then you got yourself a belly to be proud of. Down the avenue just a skip and a jump to the west you wind up back in the busiest part of the planet at A Taste of India and its neighbor The Peking Palace which is by now one of the oldest eateries in the Valley considering I remember eating there as a kid and that wasn’t yesterday. If you did not want to travel that far, you could back up two buildings and land in Italy at Ferraro’s where the owner Pat Ferraro still speaks in a heavy accent 50 years after moving to Spokane from Italy at the age of twelve. Across the street, Monica Sanders who owns the cupcake shop, Love at First Bite, speaks with an equally charming accent that she has retained from her motherland of Columbia. The new kid on the block is Two Columns Greek and Italian restaurant located at the recently old T Pranos, formerly known as Pinocchio’s and originally known as Wendy’s. Owner Masada Areano, who immigrated to America after picking up a doctorate in business at Cambridge 30 years ago, certainly fits into this varied Valley neighborhood. Two Columns may be the only place in town serving homemade gyros which makes those of us living close to the Valley’s International Mile quite fortunate. Additionally, the Mediterranean menu is emphasizing gluten-free and vegetarian dishes that have become sought after amongst the dining crowd. This is a small enterprise where the owner is cooking and serving the recipes he brought with him from the region of his ancestors. There is something very genuine and old world about that and I hope the Valley embraces his efforts. We should because we are, after all, a culturally diverse and sophisticated little city, cuisine-ly speaking. 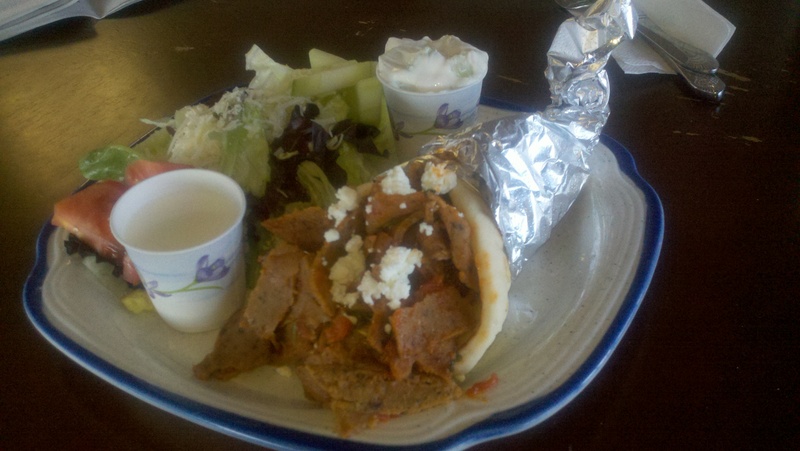 This Gyro was absolutely as good as I’ve eaten.Though admittedly not that experienced, I have had a few of these ethnic eats. It and the rest of the homemade menu are a welcome addition to our little strip that rivals a worlds fair for cuisine diversity. The price at only $7.50 makes it food fare fit for even our tightly-mitted, fair little village.